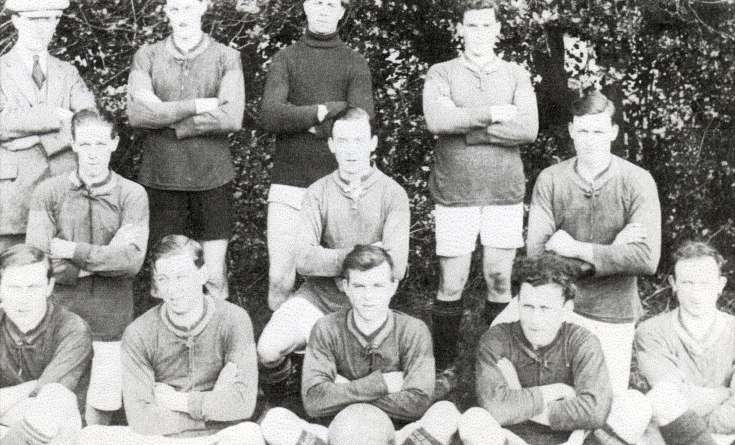 This photograph of Warninglid football team has been heavily cropped at some time but I think all the players seem to be there, with bits missing!. Researchers say that that just over half of the population cross their arms with the left forearm uppermost, but most of these men have them folded the other way. Perhaps things have changed since 1922. Or has the photo been reversed? Left to right, back row:- Reg Turville (Gardener - Colwood), Hedley Furze, Jack Canfield (Gardener - Freechase), Fred Upton (Gardener - Stroods). Middle row:- Jim Newnham (Farmer – Portways Farm), Joe Tarling, Bill Newnham (Farmer – Portways Farm). Front row:- Bill Packham (Gardener – Colwood), Bob Prevett (Bricklayer), Charlie Langley (Bricklayer – Leonardslee), Jack Constable (Gardener – Lydhurst), Not known. Jack Canfield was my Great Uncle.